Centre of Excellence for integrated approaches in chemistry and biology of proteins links knowledge, experience and technology of top Slovenian research groups involved in research in biomedicine, biotechnology and understanding of life in extreme conditions. The main research targets of CIPKeBiP are proteins together with their DNA and RNA. All together are representing the corner stone for all molecular processes in living organisms and cells. The transfer of knowledge in the industry environment is integrated into the research of the centre of excellence. The education of the early stage researchers is finacially supported by the Slovenian Research Agency. Mentor Prof. Dr. Dušan Turk, duration from 1 November 2011 until 30 April 2016. ARRS code: 34422. Piotr Sosnowski received Krka award in 2016 for PhD thesis titled "Structural insight in the substrate specificity of cathepsins". Mentor Prof. Dr. Stojan Stavber, duration from 1 November 2014 until 30 April 2018. ARRS code: 37542. Klara Cebular received an award for the best poster entitled "Direct metal-free dehydrative cross-coupling of alcohols and alkenes catalysed by molecular iodine under solvent-free reaction conditions" at the 6th International IUPAC Conference on Green Chemistry in September 2016 in Venice, Italy. 5. In 2017 new early stage researcher will be selected, post will be at Jozef Stefan Institute. Mentor will be Prof. Dr. Dušan Turk who was selected as mentor in open call. European Regional Development Fund (85% co-financing) and Slovenian Ministry of Education, Science and Sport (15% co-financing) were co-financed the development of centre of excellence CIPKeBiP with an operation code OP13.1.1.2.02.0005. The period of financing was from 2010 until 2013. •	Investigation of intermolecular interactions from different point of view including biochemical and structural analysis and microscopy of cells and tissues. Different mechanisms of intra and intercellular communication are responsible for correct functioning of cells, tissues, and indirectly for the whole organism. Any disturbances in mentioned mechanisms influence on the organism with some serious health consequences. Knowledge about these mechanisms is required to better understand the pathogenesis of diseases that result from damage or disturbance to inter-and intracellular communication. Additionally, the identification of the potential new drug targets is possible. •	Super-resolution optical microscopy to study subcellular organelles in living cells. 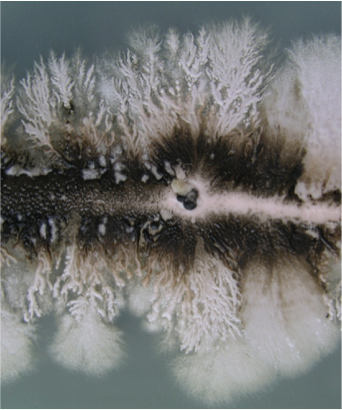 The research work was focused in investigation of proteins involved in adaptation to high salinity in the halophilic fungi. Additionally we tried to determine their potential use in addressing environmental and industrial problems. We were particularly interested in the nature of interactions between proteins involved in signal transmission along the HOG signaling pathway. For this purpose, we performed a structural characterization of the most important proteins of halo tolerance. The new knowledge was comparable with the currently known information about the yeast Saccharomyces cerevisiae, which was sensitive to elevated salt concentration. Comparing of the two systems allowenabled the interpretation of the mechanisms of halo tolerance. The role of individual proteins were further confirmed by functional complementation of S. cerevisiae. •	System for continuous production of proteins was developed and it is in permanent use. System includes some relevant protein targets, their analysis, cloning, expression, purification, and basic bio-physical characterization. •	All DNA constructs and isolated proteins are stored in a central storage system. •	We developed a database for recording and storage protocols for expression and isolation of proteins (and other experimental data), which are always available to partners in a CO CIPKEBIP and the wider environment. Russian coordinator Dr. Sergey V. Lapin, St Petersburg Pavlov State Medical University, St. Petersburg. Metastasis is the most serious challenge for cancer treatment, representing the major death-determinant and causing a significant reduction in the quality of life. A hallmark of the malignant process is the acquisition of an invasive phenotype that allows neoplastic cells to invade surrounding tissue and disseminate into specific organs. The objectives of the present project are to identify molecular pathways involved in the regulation of interplay between cancer cells and their microenvironment both at primary and secondary sites. Proteases are now recognized as key regulators of a complex network of interacting molecules that modulate the properties of cancer cells and their microenvironment. Among them are lysosomal cysteine peptidases (clan CA, family C1), so called cathepsins, involved in a number of cellular processes important for normal cell function as well as playing an important role in some pathological conditions, such as cancer. The expression of cysteine cathepsins have often been positively correlated with a poor prognosis for cancer patients and measured as potential prognostic markers for several types of cancer. Proteolytic activity of cysteine cathepsins is regulated by endogenous inhibitors stefins, cystatins and serpins. The fluctuations in their expression have been linked to pathological states including cancer; however, their specific roles in that process remain poorly defined. This project was initiated to critically evaluate the importance of the extracellular and intracellular lysosomal cysteine peptidase inhibitors from tumor cells and different cell types in the tumor-supporting stroma for tumor progression and metastasis. The work is based on genetically modified mice with a constitutive deficiency for protease inhibitors (stefin B and cystatin C). Transgenic mouse model of mammary carcinogenesis – Tg(MMTV-PyMT) – will be initially used for analyses of different stages of tumor progression (tumor growth, histopathological grading, etc.) and metastases (incidence, growth, etc.) in correlation to protease inhibitors expression. We will immunohistochemically analyze primary tumors and metastasis of PyMT mice for processes important for tumor development and progression, including angiogenesis, cell proliferation, apoptosis, invasion, etc. The primary tumor cells, obtained from mammary tumors of PyMT transgenic mice (wild type and depleted in protease inhibitors expression) will be used as a basis for investigations of tumor-stroma cells interactions, pre-metastatic niche concept, in vitro invasion and other assays. In order to dissociate the effects of primary tumor cells and tumor microenvironment for tumor invasion and metastasis, we will use an adoptive transfer models, either implanting tumor cells in the fat pad or injecting them in the tail vein of recipient mice. The use of genetically modified animals is essential to study the early steps of cancer progression and metastatic dissemination in a complete organism with an adequate associated environment. However, the current project aims at reducing the need for animal use through the development of alternative in vitro methods. Transgenic (MMTV-PyMT) mice cells will be obtained through the consortia of the EU FP7-HEALTH project “Understanding and fighting metastasis by modulating the tumour microenvironment through interference with the protease network.” (MICROENVIMET), FP7-HEALTH-2007-A / 201279 (O. Vasiljeva co-PI), 2008-2012. 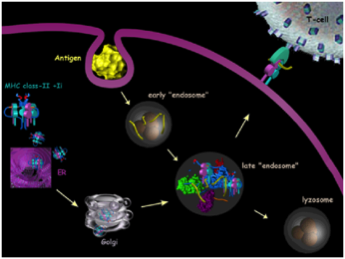 Proteases are currently one of the major targets for new therapeutics. Moreover, protease inhibitors as well as the use of apoptosis-based strategies are currently of major relevance in cancer treatment. Therefore, the results of the proposed project will be of great importance in evaluation of cysteine cathepsins as possible therapeutic targets in cancer. Oligomers of amyloid forming proteins will be the connecting theme of this project, which will encompass cross-disciplinary aspects stemming from higher oligomers structure, their role in the kinetics and thermodynamics of amyloid fibril formation, novel physico-chemical properties of the oligomers, molecular interactions of the oligomers with membranes and among themselves (protein: peptide interactions) and cellular phenomena which occur as a consequense of protein oligomerization and aggregation, such as autophagy and oxidative stress. 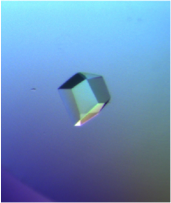 In more detail, we will try to determine stefin B higher oligomer (higher than the tetramer) 3D structure, by using crystallography and supplemented by heteronuclear NMR. Further we will determine stability of the oligomers, dimers, tetramers and higher in comparison to the monomer, using spectroscopic and calorimeric (DSC) techniques. Role of the oligomers in the kinetics of fibril formation and role of proline residues to oligomerization and amyloid formation will be determined by the usual kinetic approaches and mutant studies. Oligomers conformational changes at membranes and permeability studies will be made. Protein protein interaction between the oligomers of stefin B (or ß2-microglobulin) and other amyloid peptides, such as a-synuclein (or amylin) will be measured by using surface plasmon resonance (SPR). We will study oligomers of a globular protein human stefin B– as a good model (protocols exist how to isolate them) but not exclusively. As comparison we will study a-synuclein from the class or natively unfolded proteins, which build Lewy bodies in Parkinson's disease and ataxin – which is representative of the polyglutamine repeats disorders and possibly another member of globular proteins - ß2-microglobulin, which is found deposited in joists and bones of patients undergoing long-term hemodialysis. The mechanistic and structural studies of the prefibrillar oligomers in vitro will be supplemented by cell culture studies, with an aim to reveal cellular processes accompanying protein aggregation. Cystatins, including stefin B, are involved in important physiological processes and their gene alleles may represent a risk for Alzheimer’s disease (AD). Cystatin C allele-B undergoes impaired secretion and represents a risk factor for AD. As recent data show, cystatin C also has a role in autophagy, which is the primary means of clearance protein aggregates from the cell. Stefin B, whose mutations cause progressive epilepsy of type 1 (EPM1), on one side prevents oxidative stress and cell death (apoptosis), which are increased in stefin B KO mice. However, stefin B on the other side reduces autophagy, which means that authophagy proceeds to completion in stefin B KO cells, which helped to clear amyloid pathology in a mouse AD model. Stefin B also is involved, by an unknown mechanism, in innate immunity. Many of these effects are cathepsin independent and cystatins alternative functions to protease inhibition are suggested. Studying cellular and membrane phenomena caused by oligomerization and amyloid fibril formation of stefin B and its EPM1 mutants as well as a-synuclein and its mutants involved in PD, is of direct medical relevance; contributes to Molecular Medicine (paper in press by Polajnar & Žerovnik in Trends Molecular Medicine). The project will connect different disciplines and is thus interdisciplinary: it spans the fields from structure, molecular and cellular properties to eventual function and pathophysiology of the prefibrillar oligomers. The project entitled: ‘Oligomers of amyloidogenic proteins from a to z: biophysical properties, structure, function and mutual interactions’ falls under 5th priority of national (and EU) research program: health and science about life, interdisciplinary studies in the field of natural, biotechnical and medical sciences. 3-dimensional structures of biological macromolecules are the key to understanding of the chemical basis of physiological processes in the living organisms, yet they are a result of gathering the experimental data and their interpretation. The perfection of crystals of biological macromolecules seldom enables collection of dat a sets at resolutions which enable determination of individual atomic positions independently from their surroundings. Therefore prior knowledge is used to assure that the resulting structures are chemically and physically reasonable. The notions a) that the structures in the current Protein Data Bank entries are not optimal for use in the ligand binding prediction studies, b) that the extracted statistical parameters from the small molecule database may overcome this problem, and c) that modeling studies may provide better targets for ligand binding than the experimentaly determined structures indicate that there may be systematic inconsistency in the prior knowledge. The bonding parameters in use, which restrain the geometry of biopolymers, have been extracted from the small molecule crystal structures by statiostical approach, however, those for the heterocompounds as well as nonbonding parameters have other sources. Therefore we plan to investigate the dependance of the crystal structure accuracy from these terms. In particular the nonbonding terms will be address since they effect almost every single macromolecular crystal structure. Re-refining the structrues by using the alreday developed statistical nonbonding parameters from the groups of Klebe (Uni Marburg) and Sali (UCSF), we plan to examine the orgin of the discrepencies between the small and macro molecular worlds and to improve the accuracy of 3D crystal structures deposited in PDB. This will be done by revisting the already published works of collaborating groups and applied and co-developed in a drug discovery project. The results are expected to have an impact on the whole structural biology community. The ultimate outcome of this project, extending beyond its time frame, is an automated procedure for re-refinment of all PDB entries which will be continously updated with the progress of knowledge and technology through the years to come. The findings will be published in high quality scientific journals. The tools and procedures will be made availabe to the academic and industrial community via the www interface and as tools for the lab use. Cancer is one of the most debilitating diseases in the developed world. Despite major investments, mortality is still very high and current therapies are still only partially successful, one of the reasons being insufficient knowledge about the molecular mechanisms leading to cancer progression. Among major factors contributing to cancer development and progression are proteases. In addition to metalloproteases, cysteine cathepsins emerged as major contributing factors, which is largely based on gene ablation animal studies. In addition they also have a critical role in autophagy, which is considered a major survival mechanism of cancer cells. However, molecular mechanisms underlying cancer progression and the involvement of cysteine cathepsins in these processes are still not well understood. The main ideas of this proposal are to identify the cysteine cathepsin signaling pathways in cancer based on the identification of their physiological substrates, to critically evaluate their role in autophagy linked with sensitization of cancer cells to cell death, to explore the potential of novel rapamycin analogues in targeting autophagy and to validate novel tools for selective monitoring of the cathepsin activity in live cells. A long-term goal of the project is to unravel the role of cysteine cathepsins in hyperproliferative disorders such as cancer and their potential in anticancer treatment. This is based on a hypothesis that cysteine cathepsins represent one of the major components of cellular signaling in these processes with a dual role as cell death promoters or cancer promoters. This project should thus provide a fundamental insight into how cysteine cathepsins promote cellular signaling in biological processes leading to cancer. The gained knowledge will significantly contribute to our understanding of the complex biological phenomena and will be instrumental for biomedical research to understand and develop novel strategies to combat cancer and other hyperproliferative diseases, based on the modulation of the activities of the cathepsins or on novel rapamycin analogues with improved properties.